Abraham Hyman Emanuel was an Easterner who made his fortune in the gold and silver mines and mining towns of the American West. Leopold Ephraim, born in Chulm, Prussia (now Poland) on April 16, 1850, left Europe for America in 1869 to avoid military service for Russia. Born in New York in 1911 when his famous father, the humorist Will Rogers, was starring in the Ziegfeld Follies, William Vann Rogers Jr. grew up in the house that is the centerpiece of Will Rogers State Historic Park. With that proclamation, the first Pima County Board of Supervisors began its duties. The first four counties in the Arizona Territory — Yuma, Mohave, Yavapai and Pima — were created on Nov. 6, 1864. Each, at its own expense, had to provide a suitable courthouse, a jail and fireproof county offices. This 1954 photo of the opening of Switzer’s Department Store in Park Central Mall (on Phoenix’s Central Avenue near Thomas Road) captures the moment when the small town that Phoenix had been in the first half of the 20th century began its transformation into today’s decentralized urban megalopolis. The happy pair cuddling under the neckers nook sign are John Marion Wikle (sounds like cycle) and his wife Margy, born Margy Lee Standage. 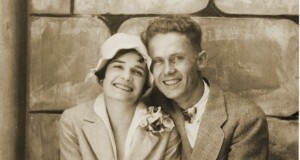 Though this late ‘20s photo was taken in Los Angeles, John and Marion were Phoenicians who from the late 1930s to the 1970s owned and operated Wikle’s stationery store, a fixture in downtown Phoenix for 60 years. Lake Mary, a man-made body of water, was created less than a year after a dam was built in a shallow valley south of Flagstaff. Remnants of a temporary sawmill and living quarters can be seen in this March 1905 photograph of the lake, which measured half a mile wide, 6 miles long and 28 feet deep. Baby-boomers finishing their education and starting families sought the small-town feel of Flagstaff in the 1970s and 1980s. Well-paying jobs were scarce; so many PhD’s served drinks and waited on tables until they could find suitable employment. One of the best places to find a career was with the W.L. Gore Company that opened its Flagstaff plant in 1967. 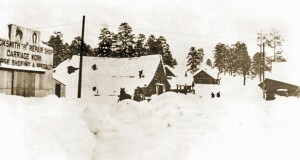 One of the biggest snowstorms in Flagstaff history began early on the morning of Dec. 30, 1915. During the subsequent 48 hours, 64 inches of snow fell on the town.